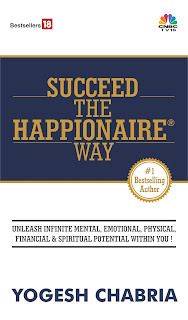 Yogesh Chabria - The Happionaire ​Blog - Best Motivational Speakers In India - Inspiration, Success: Who Is A Happionaire According To You? I like making things fun, interesting and interactive. I think that's the best way to learn new things. I use the same principle even when I am educating myself or others about investing. Many people have sent me e-mails and messages asking me for the exact meaning of "Happionaire." It is nice to know that The Happionaire Way has already started creating so much curiosity. I feel that each one of us as human beings is special and has unlimited potential and knowledge within us. Whenever we get curious, automatically a part of us searches and longs for knowledge. I’m sure many of you might be having ideas and thoughts of your own when you hear the word “Happionaire.” I would like to know what the word Happionaire means to you and who is a Happionaire according to you. You can share your views by posting them in the “Comments” section. It would be nice to know what fellow Happionaires like you think, and the ones we like the most would be credited in our next book and our soon to be launched website. To me a Happionaire is somebody who is filled with happiness. All of us as humans are meant to be Happionaires. I agree with you fully Sunita. I think it is the most important thing for anybody in life to be happy and be a happionaire. Just read your article on IPOs on moneycontrol, was really revelant and helpful. I think we all are saying the same thing Raj and Sood. But Sood one thing i want to add maybe you don't agree with me that you say even after earning money you have experienced unhappiness thats just normal but don't you think a few problems do reduce with some money. So if given a choice to be with or without money most of us would want to be with money. I think Happionaire is as Sood said a part of being full of happiness like millionaire is with millions and billionaire is with billions. I think we all should be Happionaires first and then other things with Yogesh's help will fall in place. Before we create wealth we need to put importance to happiness and not forget what our real goal in life is. I am so happy to see and read the discussion here. A smple answer to ur question is "All us humans are Happionaires." Today when in our country we have people doing politics of divisions this philosophy of Happionaire is what needs to be spread. To me it is about economic prosperity, knowledge and happiness. It is about brining wealth and happiness in our life. As othrs have said already it is a revolution which all of us need to be a part of and spread together. Being a Happionaire to me is being myself and thinking positively. It is for us to decide "a" that we want to make this world filled with Happionaires. I'm really waiting for Yogesh's book to come out so i can find out about this wonderful concept in the world of investing also. Thanks fellow Happionaires for sharing your views and ideas and I would also like to thank all the people who shared their ideas via e-mail. A few of the comments and feedback might end up in ITHW too! Smile of satisfaction makes you Happionaire. I loved your definition Jayant. A Happionaire is somebody who is a hero without needing any zeros. A Millionare is a person who has millions of money, but it does not necessarily mean a millionare is happy. A Happionaire is an aspiring Millionare/Billionare or may not even be a millionare/Billionare but he/she is one who is definitely very happy, A Happionaire is one who is more exicited, zealous & Charismatic than a Millionare! I am glad to hear what you said Jayant, Kabir and Bharath. I must say that most of you even without me saying anything have truly understood a large part of what The Happionaire way is about. I have always believed that all of us have unlimited potential and intelligence within us. Just the fact that all of you haev been able to understand what I wanted to say proves that we all have knowledge within us. Do keep the new ideas and thoughts flowing. It is said that Happiness is a state of mind. While no state is constant in the universe, a person who can bring himself/herself back to the state of Happiness is a "Happionaire"
If riches in currency measure a Millionare or Billionare, riches in terms of Happiness(though immeasurable) defines a Happionaire. Thanks for the kind words Yagesh, Kabir, Meghana and members. thats a superb term you coined! For me , happionaire is not only in terms of monetary gains or social status.It's about pursuing my passion.It's about getting lost in something you are so passionate that you forget the world around you. I am 22 & am a guitarist & I know when I am playing the guitar I am in a true sense a happionaire..I feel like being on top of the world.It's like floating in an altogether different space.That's what Happionaire is for me..When I do that I foeget that fact that I have lost more than a lakh in the stock market..
1. True peace of mind or happiness comes by accepting the worst !!.. 2. You cannot make man happy, he must learn how to be happy ! !